The first qualification to actually proceed in the path of becoming a spiritualist is simplicity. One aspect of simplicity is the willingness to just accept what God provides and not hanker for anything more. This kind of simplicity was the glory of ancient India. In a place called Navdvipa, there ruled a king called Raj Krishna Chandra. He had much wealth, and he was very charitable to the Brahmins, the intellectual class of Vedic social system. There was one Brahmin who was lived in abject poverty by material standard. Raj Krishna Chandra went to him and said, “I want to help you. How can I help you?” The Brahmin very honestly mulled over it and said, “Actually, I don’t need any help. I have a few students who every now and then give me some rice and my wife cooks that rice in one little pot we have.” Pointing to a tree outside, he continued, “Do you see that tamarind tree? I collect some leaves from it and put it in my rice to flavor it. I don’t need anything else, I don’t want anything else.” When people find inner satisfaction they really don’t need to complicate their lives with so many of unnecessary necessities of this material world. Yet, at the same time, a Bhakti Yogi is willing to accept anything for the service of the Lord. 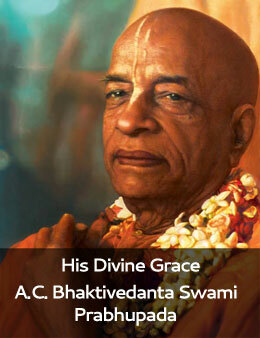 Srila Prabhupad said who is a true Bhakti Yogi. If that person is living in a palace, and to better serve God if it is required to live under a tree, there is no hesitation on his/her part to make that adjustment. And if the person is living under a tree, and to better serve God if it is required to live in a palace, there is no hesitation on his/her part to make that adjustment. Another aspect of simplicity is to simply and innocently accept what comes from God and the scriptures. We cannot understand God unless we have innocent faith. Big knowledge gives no access to God. Knowledge is helpful in teaching and for discriminating good and bad, but ultimately unless it is based on the essential principles of faith and devotion; it has no bearing in our spiritual advancement whatsoever. We should have faith, “God loves me and He will protect me.” This is the essence of spirituality. It does not matter how many scriptures we memorize, does not matter how many austerities we perform, does not matter how many mantras we are saying, we have to become simple and faithful to realize God. What is the purport of Bhagavad Gita? Arjuna was told 700 versus of the Bhagavad-Gita. But what was the conclusion? He became like child, “Krishna I accept whatever You say. I will do whatever You want.” The culmination of all the philosophies was that Arjuna became simple, innocent like a child. That is the aim of life. There is no question of material qualification or disqualification. If we are sincere, Krishna grants us this faith and our life becomes uncomplicated. Simple innocent faith is the Grace of God and the essence of all scriptures. such a clear understanding maharaj gives about simplicity. Thank you HH Radhanath Swami for instructing to be always keep innocent faith on Krishna and to be simple. Many thanks to Radhanath swami for this wonderful blog. Thank you HH Radhanath swami for guiding us to lead a life of simplicity and explaining the meaning of simplicity. Simplicity means accepting whatever comes in our life whether good or bad for the purpose of serving lord and the devotees. When people find inner satisfaction they really don’t need to complicate their lives with so many of unnecessary necessities of this material world. Yet, at the same time, a Bhakti Yogi is willing to accept anything for the service of the Lord. Very nice lines.. Simplicity and humility qualities which attract Krishna. Thank you so much Maharaj for explaining Simplicity in so easy yet powerful words..Hari Bol! MANY THANKS TO RADHANATH SWAMI FOR HIS WONDERFUL ANALOGIES AND FOR MAKING SPIRITUALITY SIMPLE TO UNDERSTAND. Radhanath Swami Maharaj so simply explained Simplicity. Thank you ! I was struck by the following statements in the 2nd paragraph “Knowledge has no bearing in our spiritual advancement whatsoever. Thanks a ton for sharing..
Radhanath Swami is realy great no one is like him,Becouse Radhanath Swami is only one. Simplicity is so essential to tread and grow on the spiritual path. The first qualification to actually proceed in the path of becoming a spiritualist is simplicity – very true! Thank you for showing us how important simplicity is in our spiritual lives. One aspect of simplicity is the willingness to just accept what God provides and not hanker for anything more – if we can just follow this one principle, people would not need to fight wars and the world would be the best place to live in. When people find inner satisfaction they really don’t need to complicate their lives with so many of unnecessary necessities of this material world powerful statement! Simple innocent faith is the Grace of God and the essence of all scriptures.- wonderful words to medidate upon. Wonderful article on simplicity that teaches us how to lead a simple life in spiritual life . Thank you very much . This teaches us that to advance in spiritual life one should be simple and faithful to realize God. True! Simplicity is the basis of our spiritual lives ans it is imperative for us to cultivate it. We should have faith, “God loves me and He will protect me.” This is the essence of spirituality. Amazing words! Such a powerful and eye opening lecture on Simplicity and its importance in Spiritual life. We should have faith and child-like innocence to lead a simple life! !